There is a fundamental principle in lighting : the larger your light source, the softer your light. Using any of the myriad of flash modifiers that are on offer, helps in achieving that – spreading the light from the on-camera Speedlight much wider, thereby creating softer light that direct flash would’ve given. However, (and this is a big however), these flash modifiers also throw light forward. Ultimately all flash modifiers do the same thing – they disperse a lot of light around the room, while throwing some measure of light directly forward to lift shadows under the eyes and bring a sparkle to the eyes. That is a huge step up from using direct flash – (or poorly bounced flash.. ie, flash at 45′ or 60′ forward) – but won’t be as good as directional light. Directional light falls onto your subject from a specific angle. This direction can very often be carefully chosen even when you use an on-camera flash indoors. 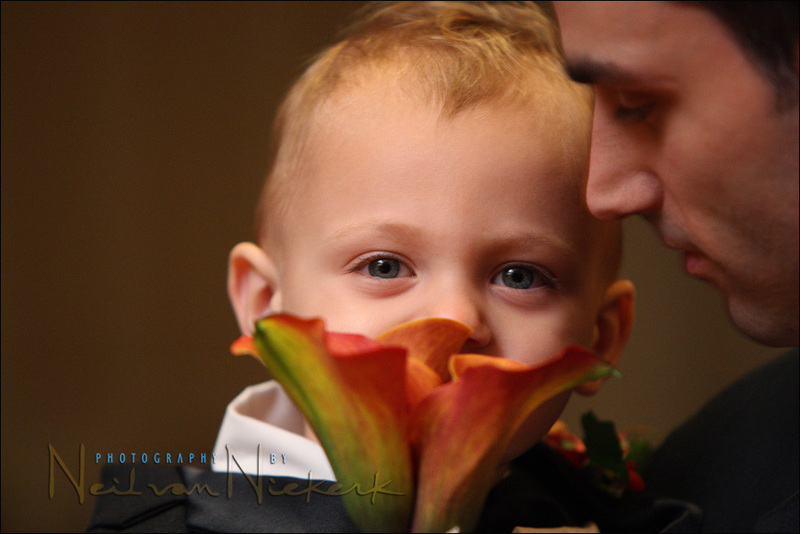 For this candid portrait of the ring-bearer, I touched up the WB in RAW, and that’s that. Simple, and it looks just great. The light is soft, and the little guy wasn’t bothered by any direct flash … since there was NO direct flash at all. The way I achieve directional light from my flash is by adding what is in effect, a half-snoot on my on-camera flash. The half-snoot (or flag) will partially block the light, and also direct it. 1. Directional light. I can now much more precisely direct where I want my light to come from. 2. Less annoying to others. In turning my flash to the side or to point behind me, I would risk blasting other people directly in the face with flash. This piece of black foam keeps that from happening. I now direct my flash over people’s heads, and I don’t blitz people in their faces with direct flash when they stand next to me or behind me. To further explain this, here’s a video clip where I demonstrate how to use the black foamie thing to flag the light from your on-camera flash. I also very often when shooting in tungsten light, use a filter on my flash to bring the cold light of the flash closer to the warmer tones of tungsten light. 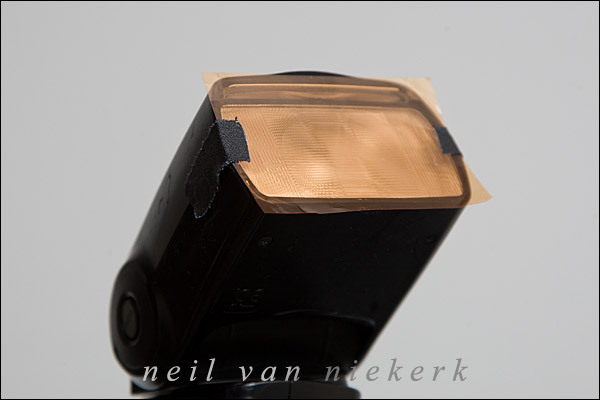 I simply stick a piece of gel over the head of my Speedlight with some gaffer’s tape. It is low-tech, but it works. By gelling my flash for tungsten I change the grungy orange backgrounds to a more pleasing warm tone. The gel used in the image of the baby above, was full CTS. I keep my camera’s WB to Tungsten. And in post-production I fine-tune the WB, since by bouncing my flash, it picks up an additional color from the walls and ceiling. The gel shown in the illustration here is 1/2 CTS. I then keep my WB of my camera to 3800 K, which is still much closer to Tungsten, than the 5400K of flash. The black half-snoot / flag that I add to my Speedlight is just as simple. It’s a piece of thin black foam bought from an arts store, and then cut smaller. 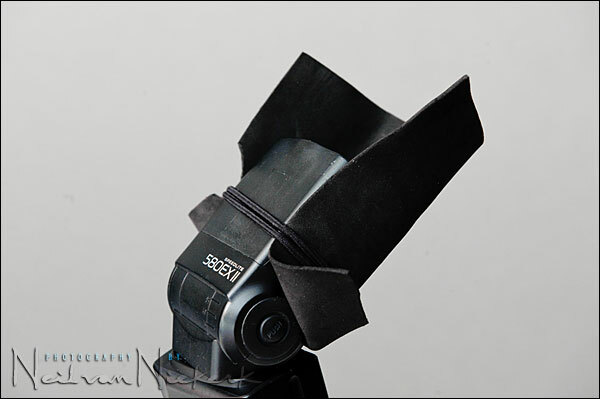 I keep the piece of black foam tied to my Speedlight with a hair band that I stole from my daughter. Yup, low-tech and simple … and it works! And there they are – the only light modifiers that I use when I use on-camera Speedlights. 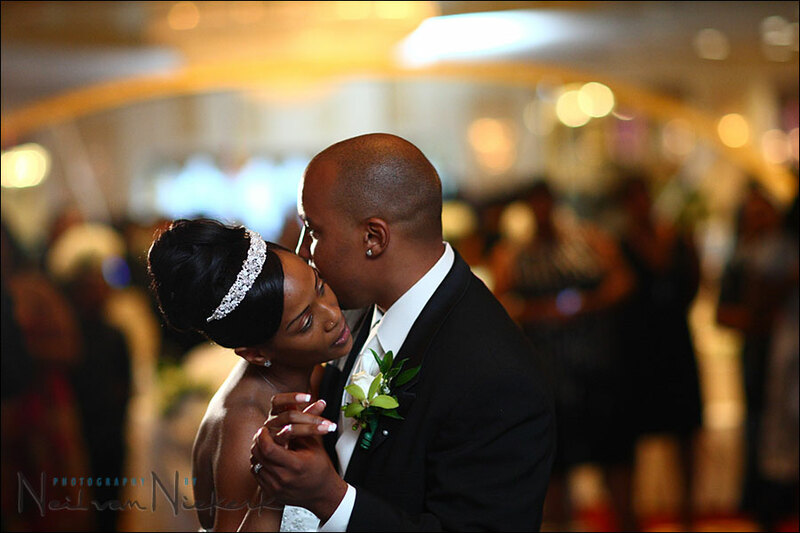 In my work as an wedding photographer in New Jersey / New York, I often do use off-camera lighting, whether Speedlights or Q-flashes. But with on-camera strobes, these are the only light modifiers I use. And they are all I really need when working indoors. Since I frequently gel my flashguns to turn the WB of my flash much warmer (usually for Incandescent light), I use these gels that I cut up and tape to the top of my speedlight’s head. One of these sheets (which aren’t expensive), will give you a lifetime supply of these filters. For me, these gels are an invaluable part of flash photography. Tape the gels down on your lens hood when not in use. If you like learning by seeing best, then these video tutorials will help you with understanding flash photography techniques and concepts. While not quite hands-on, this is as close as we can get to personal instruction. Check out these and other video tutorials and online photography workshops. If you find these articles of value, please support this website by using these B&H and Amazon affiliate links to order your photo gear. I also offer photography workshops and tutoring sessions. There are also video tutorials, which are online workshops on photography. Join us on the Tangents forum for further discussions, and stay informed via the monthly newsletter. You can also join our thriving photo community in the Tangents group on Facebook, where we show our photos and discuss all things photography. Please follow me on Instagram for more. Pure brilliance. Such simplicity. I am a 100% convert to this blog. like it! Nice look and great effect. Do you find that the foam “blocker’ allows enough light to hit the subject in front of you? Albert .. With the black material flagging the flash, all the light is indirect. This means that most of the light from the speedlight is ‘wasted’ and the speedlight uses a LOT of juice. A battery pack of some kind is a necessity. But the results are worth it. Wonderful Information! What is the difference between the gel material and the amber stophen and when would you use one over the other? Hi there Joel … the 1/2 CTS and the amber Stofen will both give you light from your flash which is around 3800K. So there isn’t much difference in the colour of the light. The difference comes in that the Stofen throws some light forward onto the subject. Which I sometimes want. But often enough, I don’t want that. And when I want indirect, yet directional light .. then I use the black snoot with the colored gel over the flash head. Very impressive !!! Peter Gregg said to check you out, and he was right … you have the touch. I too use a Stofen, and reside in Santa Cruz where Stofen is located. If you ever plan on heading out this way, let me know. Dinner is on me! Hi, your blog is awesome. It’s truly very informative and helps people like me steal a few paces up the learning curve of flash photography. Thanks. And can’t wait for your next post! Just echoing what Rishi said. This is a great blog. Thank you for being so generous and sharing your knowledge with us learners. You stated that the for the picture of the baby you used a full CTO gel. Was that to match a different temperature? Personal preference? If you were matching a different temperature how did you come to the conclusion of using the 2900K gel? My choice was far from scientific, but just a general guess that I should use a stronger filter than 1/2 CTS (which is my preference). I don’t carry a range of filters, and wouldn’t bother to specifically gel it to any particular color temperature. Also, in bouncing off different parts of the ceiling, the colour temperature from the flash also varies. So the choice is a very rough guess, and then any color casts are touched up in raw workflow. In the end, the work that I do are portrait related, and not product or catalog photography where exact colors of all parts are essential. I just need great skin tones, and personally I just want less of a difference between the background color (tungsten), and my flash. I hope this approach makes sense. Hi Neil, Thanks for your insight. I shoot a lot of community events (not sporting) in a large gymnasium – pretty high ceiling. Next time, I’ll give the Neil-ized Stofen a try. I have a few questions, though. -Due to the size of the room, I believe using any stofen would waste all the light being thrown behind the camera. I was thinking of putting black gaffers on the back of the stofen to prevent some light loss. Have you ever tried this? Would this throw too much light directly forward? Thanks and Happy New Year. What I have tried a few times in the past, is to raise the white bounce card inside the Stofen, in the hope that this will help minimize light spill backwards. But I suspect that this would have marginal effect in increasing the power from the flashgun, so I didn’t continue doing so. Hey Neil, great article. When you shoot with your black modifer are you using any other room lights? Also, can you give me an idea of what ISO and f stops your using? I’m guessing your maybe shooting at around f4 ISO 1600 or so. I love the effect and can’t wait to try it. This image was taken at 1/50th @ f3.2 @ 2000 ISO. In bouncing flash this way, there is considerable light loss, so I typically have to work at wide apertures and higher ISO settings. Thank you for sharing your insights. They are very helpful. 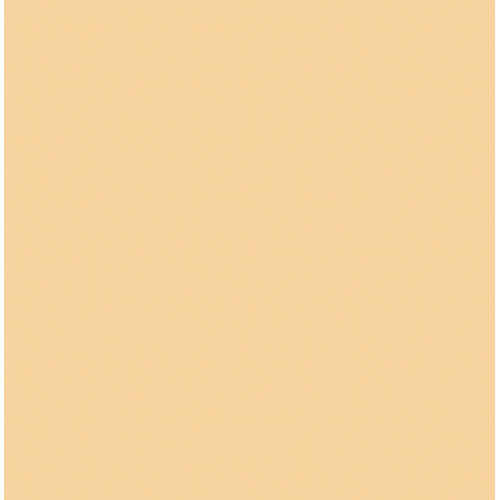 I found a product of LumiQuest ) that shares the fundamental concept of your 40-dollar black half-snoot, although its price tag is no less than yours. The bonus of its entire system allows you to redirect the flash forward with a (coloured) metallic card attached to the opening end of the hallf-snoot, when the flashgun is directed upward or to the side without too much tilt. It also allows you to further difuse the redirected lights with another screen attached to the opening side of the half-snoot. I am wondering if such concept is useful when a direct flash is not ideal, when bouncing is not possible, or when shooting outdoors, as well as if this would result in a better light quality than Sto-fen as far as on-flashgun diffusion is needed. How do you see that the inside of the half-snoot is somehow reflectible? I used white half-snoot (more reflectible) with a wider opening (less directional) but I love so much you ninja style. I believe your design or adjustment is based upon some experience and renders better light quality. Would you care to share with us the reason? Many thanks and Happy New Year ! Does this also in effect mean that the required power of the flash could be dialled down slightly as you are not losing as much light ‘around the sides’, or negligible effect? Nope, you still need correct exposure. So I wouldn’t dial the flash down. 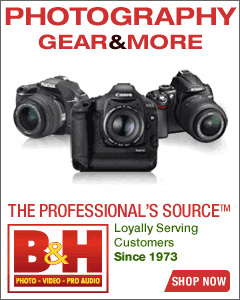 Hi Neil, Do you use the H setting of the Canon 580EX? I believe it lowers the output level, but it seems to simplify things. To me, it doesn’t appear to mentioned much, for something that appears to be a useful idea. I wouldn’t use the H setting (High-speed flash) for anything other than the times I need a wide aperture in bright light, or fast shutter speed in bright light. I don’t agree that using the High-Speed Sync option would simplify things. It reduces your power considerably. So much so that I wouldn’t use it while bouncing flash like I do. Thanks for sharing so many of your techniques with us on your blog! You’ve helped me learn so much about using my Speedlight effectively and making flash not look like “flash”. Perhaps I will see you in August when you come to Toronto. I love the half-snoot idea of not blinding people! I’ll have to add one to my arsenal. I still had a question about the situation of a venue having high ceilings or the walls/ceilings being strong colours. You’ve shown us that you’re using a Stofen with the gel; would you actually shoot the flash head straight forward in these situations? That brings us back to the direct straight-on flash that we all despise, but how do you still keep your classic Neil-styled captured light and shape? Thanks again for your willingness to help and all your advice over the years. Hi there Christopher .. thank you for the wonderful compliments. The best results with flash is always achieved by looking at the quality, direction, and color of your available light .. and then adding flash to it. Hi Neil, I just bought a D300 and set my in-camera flash settings to 30 and 320 but now when I put the SB800 on, it always indicates that it is in FP mode. I thought that it would only go in FP mode when you set your shutter to 250 or higher. What am I doing wrong or is there something wrong with either the flash or the camera? Thank you for all the info—-I have hit sooo many ahaaaaa moments reading your blog!! Fran .. as long as you stay at or below your maximum flash sync speed, your flashgun’s power won’t be reduced by it going in to the high-speed sync mode. So even though the flashgun says FP is enabled as an option, it won’t go into high speed sync mode until your shutter speed is higher than max flash sync speed. I really like your sharing of flash techniques. Thanks so much. I love your tips. Just found this blog via a flickr group. I love it. The info. you share is so helpful. Thank you so very much! FANTASTIC blog!! I Have leart so much will definatly be coming back again and again! Thank you so much for sharing all the tips! Just a quick question, what are the approximate dimensions of your half-snoot modifier. Also, any idea about the thickness of foam? The piece of black foam is about 7″ x 6″. But I am also hesitant in even saying that, because this article is not about the piece of black foam per se .. but much more about the idea that we need to direct our light. This is about technique, not ‘equipment’. This answered my other question but on the foam, doesn’t the black foam actually absorb some light. Shouldn’t the flash side of the foam be shiny or reflective? The reason for that is that I want as little light directly from the camera’s point of view. I want as much light as possible to come from the direction I choose. It makes sense to manually zoom the flashhead like that when flagging the flash like that. It is something I’ve started to play around with to get more range. I use the Stofen on occasion when I do want to throw light forward from my camera’s view. Hey Neil, great tips…amazing tips actually. Rarely I find someone giving so much like you. If we want to block the light in one direction only, why not have a white or silver coating on the inner side of the foam to minimize loss? If we want to block the light in all directions except that in which the snoot is pointed, why note close the half-snoot into a full snoot? Brian, check out this follow-up article on why I chose a piece of black foam to flag my flash, rather than using something white. Thanks for the clarification, Neil. If I understand it correctly, a full snoot if too narrowly focused whereas a silver/white lined half-snoot acts like a reflector card bouncing light too widely. The half snoot allows you direct the light, but still allows a small amount of light to raise the ambient level. Anyway, your results speak for themselves. This is one modifier I’ll definitely be trying. This is India calling. Been sharing your info with my friends in professional photography. Been going through your blog. One thing that is striking is you are darn Good photographer and more importantly an honest one at that.Rare QUALITY these days. in halls with extremely high cielings-40′-50′. Ex: Church,Temples etc. When shootings outdoors at night- EX :parties. We don’t get any walls to bounce off. Doesn’t the half snoot eat into the flash output? Is that why you have a quantum 2×2. When stuck in situations like you describe, I use off-camera flashguns like the Q-flash, or if I am limited to only on-camera flash, I most often just use the Stofen, and accept that I will have to have at least some measure of direct flash. These are the limitations imposed on us sometimes. Using that half-snoot like that is really an inefficient use of flash. I throw most of the light away from the subject, and only get to use some of the spill light. That’s the reason I often use a Quantum 2×2 .. to give me a lot of power over a length of time. 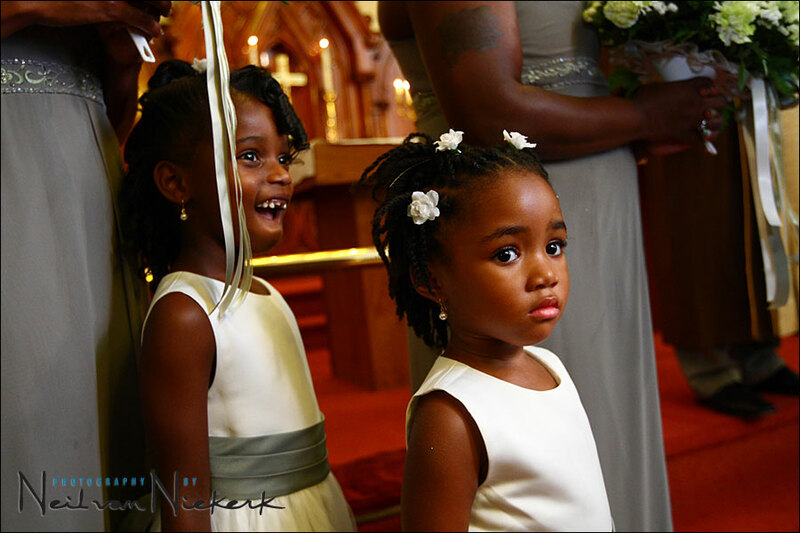 Three more examples from a recent wedding I photographed. With these images I flagged my flash with that piece of black foam, and I also gelled my flash with 1/2 CTS filter. Click on any of the photos to have a larger image appear. its amazing how $10 techniques can look almost like shot-in-a-studio…. what is a 1/2 cts filter ? if i go to a shop and tell them that will they understand me ? On the ‘my gear‘ page there is a link to B&H where you can see the actual item and description of these gels. I love your lighting mods, but more importantly, I am blown away by your stunning images. Right now though, I’m inspired to make myself a half-snoot. I’ve got a bounce card / flag, grids, and gel holder already, but I hadn’t thought of using a flag that was black on both sides. I was going to ask you why you didn’t use a white or reflective material on one side, but I found the answer in the comments. Thanks for all the info you share! now u have a fan in thailand. I have been using your black foam half snoot for some time now it produce the best looking pics! Thank you very much. However, I have one problem. The flash is always pointed to my left or right shoulder and it’s good for landscape orientation but if I shoot portraits, there will be a huge shadow cast by the snoot. What’s the best way to position the flash so that I can change to portrait orientation on the fly and still get good diffused light? I do twist the black foam around if I shoot mainly in a vertical mode. But even if you didn’t, you shouldn’t get a shadow cast by it? Since you’re bouncing off a much larger surface, the light is spread fairly evenly, and you shouldn’t have a shadow like you describe. E-mail me one of the problem images so we can figure out what exactly is happening. I just wanted to thank you for this post. At the wedding I shot this weekend, using the half-snoot vs. the traditional diffuser made my lighting directional and believable vs. flat and artificial. I want to emphasize your point of using an external power source for the flash when using this method. I used a Quantum Turbo pack with my flash and am pretty sure that it saved me at least 5 battery swaps during the course of the evening! So let’s say the Flashgun did say FP mode is enabled how do you actually know that it did not go into high speed sync mode when you took the shot? Dennison … I suppose there is no real way to know that your flash didn’t go into FP mode (high speed sync), but this is just one of the thousands of ways you have to trust the technology will do what it is designed to do when used in a certain way. Why not use a white foam snoot? It will absorb less light than black foam. Frank … here is a follow-up article on why I chose a piece of black foam to flag my flash. Hi Neil from the UK. Is it difficult to cut the hardplastic of the ‘Stofen’? Thanks for a brill blog. Alwin .. you have to adapt to the situation you’re in. When using the foamie, should the flash be set to a long or wide zoom range? One would expect to set it manually to longest zoom, but the flash just uses the zoom as if you pointed it forwards. Val, I haven’t experimented yet with specific zooming of the flash-head to control the direction and spread of light from the flash. I’ve seen some examples on the ‘net where great use was made of such precice use of the speedlight, but I tend to work a little faster than that, and I just allow the speedlight to zoom as the camera controls it. But there could be something to play around with here. One question about your black foam. Do you think it will do a better job if the inner part is white in color (probably a white card)? something like the ultimate bounce card. Or you prefer it black as you do not want too much light to be reflected? Bob, it would certainly be more efficient than the black foam. However, scroll up to the image of the bride fixing her veil … there’s an explanation of why I wouldn’t necessarily want to light to come from the camera’s point of view. Neil…I would like to know what size is the black foam sheet you use . 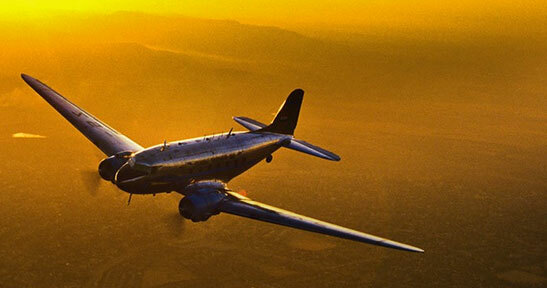 Thanks…for your answer and for all the great information on photography you have given us all. The piece of black foam is about 7? x 6?. The series of three wedding shots you posted in this thread on September 8th, 2008 are amazing. I am blown away by the 3rd image. Wow. 1.) where you pointed the black foam thingie. As the couple are on the dance floor, I am assuming there wasn’t a nearby wall to bounce off. Would you have pointed it straight up…or behind you? 2.) out of curiosity, could you tell us the lens and aperture you used. Faster than a 2.8? Can I ask what lens you used and camera settings you used? Ernst, here is a thorough discussion of this image, describing how to use flash in low light to get great results. Thanks so much for the thoughtful, detailed response. I have to say I also appreciate the two photographers who have kindly allowed me to tag along as a second shooter. One lives in Chicago (about two hours away) and the other splits his time between Pittsburgh and Florida. Yes, I am driving 800 miles to be a second shooter at a wedding in Pittsburgh! He is an award-winning photographer who apparently has taken pity on me so I might as well grab the once-in-a-lifetime opportunity. I actually shot my first wedding (as a second photographer) last weekend in a very dimly lit ballroom. Initially, I felt like a duck out of water. And then a duck drowning. The Blank Foamie Thing was my life preserver! And yes, as you guessed, I was trying to use as low a shutter speed/ISO combination as I could to keep noise down and still let in ambient light. I have another wedding coming up this weekend so I will try bumping ISO to 1600 (if need be) and shoot with a higher shutter speed. One last quick question for Neil, or others; I am using a Nikon D300 with an SB600 flash. Is the flash powerful enough to bounce light off far away walls, tables, chairs etc. Or is the more powerful SB800 or SB900 desired/required? Ernst .. the SB-600 is a sweet little flashgun, but the SB-900 would open up possibilities for you that you wouldn’t have with the SB-600 … such as being able to rotate the flashhead 180′ to either side. The extra power also helps. I just added a post on things to consider when deciding to buy a flashgun. Been re-reading lots of stuff on your blog today. I read it all when I was starting out, then later when I knew a little more, and now, when I know a little more yet. Each time, as I bring more basic understanding, I get more to take back to the field with me. Hoping to make it to one of your workshops in the fall (my family is still up in NJ). I do have one question, in the picture of the baby in this post, you have a flash catchlight in the eyes. Is that just from a “hotspot” on the 1/2 snoot or can the baby “see” the tube at an askance angle as it’s pointed away over your sholder? Haven’t played with the half snoot (as I do mostly outdoors work with blanced ambient and off camera flash) but have a family event coming up in a few weeks where I am going to use the snoot. One issue I’ve had using bounced flash (which I learned from you) is that there is often a lack of catchlight in the eyes of my subject. When I have the luxury of posing my subject, I make sure to get a catchlight from a lamp in the room, but during an event when I don’t have control, I’d like to get a catchlight. … and the moment you think like that, and bounce your flash towards the direction you want your light to come from, then you will have that catch-light. Look at this image as well in this post on the impromptu portrait of a cute baby. The same approach .. and there is the catch-light in her eyes. 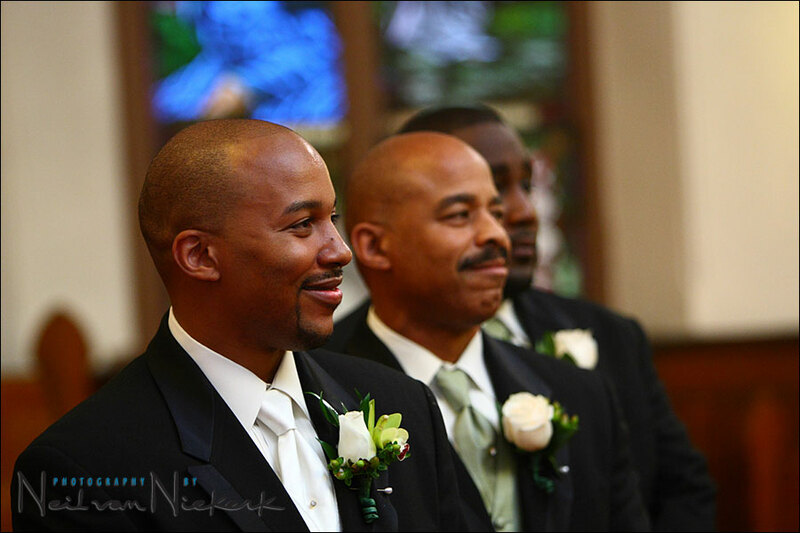 Neil, first of all those images of the African American wedding are so beautiful-I trust the couple was happy! Secondly, thanks for your generosity and sharing your thought processes. I shoot theatrical and music events and seldom am allowed to use flash-but, I have been studying, and shots like those above are really inspiring. I love how the stained glass retains its richness. You have a great sense of angles-how’s your pool playing? Thanks again. 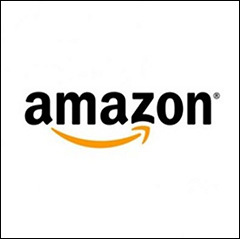 Just looked at Amazon about your comming book. How much new information is there in this book with only 128 pages? The book does contain new material and material not covered on these pages .. but there is a fair amount of overlap because of the nature of the topic. I did however rewrite much of the material to have a more logical flow instead of being random blog posts. However, if the overlap in the (free) material here concerns you in relation to the non-extravagant $23 price for the book (pre-order price at the moment) .. then perhaps consider that you will have it all in a self-contained book, beautifully printed. i would pay 50-60$ for a *really* good flashbook which covers from newbie to forced user of flash*g*. nearly all the secrects from flashmaster neil. i hope that it is a very fine tuning about this blog, not only a rough copy. so the expectation is very high. i´ve ordered my version months ago. i think i have to convert a lot to the olympus system*hear you laughing*, so i did it with planet neil also. so keep us (not so long) waiting for all surprises. wish you good luck for your book, a very good start and a lot of fall off money!! Neil…..Please don’t get me wrong, I already intended purchasing the book for two reasons…One because I enjoy reading your concise flash photography information when I am away and not on my computer and I also would have purchased the book even if it had 128 pages of blank paper just to support your wonderful non-selfish blog. Your blog is the most thorough and informative education for me on flash photography. Thanks for all!! Hi Neil. I don’t know how you do everything you do, but I was wondering, with the black foam flash angle modifier/director….have you tried, instead, to manually adjust the flash’s zoom lens to the most tele position, so that it will cover a more central area? The difference is pretty noticeable with my Canon 580EX, I have found. Thank you for your generosity in sharing your knowledge around, Neil. Nigel .. I have started doing that recently – zooming the flash-head out when I flag the flash like that. And it does give me a lot more efficiency. I do find I can use a slightly smaller aperture, or bounce into larger spaces with my flash zoomed out. Hi Neil. First of all thanks for the amazing site – it’s both hugely informative and inspiring. Many people have asked about the material and color used for your snoot, and you’ve patiently answered each essentially saying that it can’t be white because despite the extra efficiency the diffuse reflection sends too much light back into the room in all directions. When I made my snoot I decided to use some very thin black plastic, the kind that thin wallets for A4 paper are made from. The plastic was very smooth, shiny, and black, which means very little diffuse reflection but still lots of direct reflection. Once scored and folded it fitted the flash nicely. The idea was that with only direct reflection from the black plastic you can, in theory, get the same control over the direction of the light as the black foam, but with greater efficiency as well. I still need to find some foam to do a direct comparison, but I was interested to get your opinion on this in the mean time. James … as I mentioned elsewhere here, it isn’t about the piece of black foam per se, but rather the idea of looking at the direction of light. So any material or object that you use to flag the light, will do .. unless it introduces an unwanted color cast. I bought my first external flash (a 430EX II) recently and have found the learning curve steep when it comes to creating subtle effects. Your site has clarified lots of things for me, and I already have your book-to-be in my Amazon shopping cart. Thanks so much for the good work. Quick flash-newbie question: when you refer to aiming the light “behind” you, do you mean with the flash head in the upright position, angled back slightly? Or something else . . .
Hi there Josh .. when I mean I bounce the flash behind me, I’m usually bouncing it over my shoulder, off to the one side .. this way I get directional light that is soft. I was taking pictures in a church the other day and usually when the lights that are on, they are lke a soft flouresent. On this day they were off but the stained glass windows were a light amber color and so the light shining through them cast a “warm” glow in the church. I took some tests shots with my TTl flash. I was trying to experiment/practice with white balance and flash and decided to gel the flash with the 1/2 CTS and change my cam WB to tungston and found that it did not look orange or warm but “normal” they actually looked good…I was thinking that they would be really warm because of the gel and amber light.. Sorry..really new to flash photogrphy and I have read your posts on gelling over and over and i just want to understand how my pictures turned out this way. Joy .. that would happen. Since the light is very warm as it came through the stained glass window, if you now warm up the flash’s light with a gel .. you could very well have a neutral looking image if the flash+gel WB is close to the color balance of the light through the glass. and also,,just to make sure, you only gel if you know that the lights are going to be tungsten right? Or is there another time that you would? Hello Neil, This is my first post on this fabulous forum. To add to Joy Oxenrider’s post, do you when gelling, automatically set your WB to tungsten or do you do a custom WB? Also, how do you determine when to use 1/4, 1/2 or full cto? I set my camera’s WB to the predominant light source. If my subject is lit by tungsten light, and I need to add flash to light my subject properly, then I’d use a full CTS on my flash. .. 1/2 CTS if I wanted to retain some warmth in the background, and lit my subject with flash. Then I would set my WB to around 3700K. Quite often I use 1/2 CTS gel, but since I am bouncing off warm-colored surfaces, I could have my WB anywhere around 3000K or so. It depends. Jorge .. I don’t set custom WB settings. I set an approximate WB, and then fine-tune the color balance as part of my usual raw workflow. So is it safe for me to say that you can gel 1/2 CTS or CTS if say you were taking pictures at sunset and the light is predominately warm/amber and you want to retain some warmth but not want your flash to be noticeable and set your WB on your cam accordingly? Joy .. absolutely. Since flash has a cold color temperature, it would be quite noticeable if you added it to the mix when you’re shooting in the early evening and have that golden glow of color. Here’s an image I’ve used before on this site, as an example where I gelled with a 1/2 CTS filter so that the fill-flash wouldn’t be noticeable. In Elizabeth’s picture, I noticed that she has device attached to her flash, as well as to the side of her camera. What are those, and why does she use them? Chang .. what you’re seeing there is a pocketwizard, which we use to trigger additional lighting when we need to. In this case, the additional lights would be a set of Q-flashes on lightstands that we used during part of the reception, and for the family photographs. about the black foam half-snoot / flag. I just built one for myself using the modification suggested by Randall Todd. I tried at home, and i found out it does take a LOT of power more than the same setting without it. I own a 430 EX flash, so power can become a problem. I was test shooting in a 3×4 meters room, with 2.8 meters ceiling at F4 1/250 ISO 100 (EOS 40D) and bouncing at 45 degrees in different directions: I had problems reaching EV +1 to match my white walls. However with the 430 I can still manual zoom the flash while bouncing (can you do that with the 580?) and found that if I zoom it to 105mm, even when bouncing forward at 45 degrees I get no direct light in front of me at eye level (I just pointed the camera to a framed picture with glass in front of me to be sure), but I retain all of the flash power. Directionality of light is still acceptable, even if it is less defined than with the half-snoot. I have still to try it in real world conditions, but looks to me like an useful workaround when flash power is a problem. Marco .. I have recently started to zoom the flash-head to maximum, and it does seem to make a difference in the range that I get. I also often fold the piece of foam over so that it is smaller .. or just completely remove it. Also, with a flash like the SB-800, the way the flash-head is shaped, means the light from the flashgun directly hits the piece of foam, and this eats up a fair amount of power. Ultimately, there is no set way to do this .. it’s all about experimenting and playing around with the idea of flagging the light from the flash, as opposed to using direct flash, or one of the generic light modifiers. Many thanks for the tutorials-I’ve printed a number of them and i am rereading them over and over. Now that your book is available it will save me having to patch various info together. I’m using a DIY mitt shaped modifier 8″ high by 6″ wide with a white foam front, flash in upright position either hand held or at some events on a RRS rotating bracket, ETTL with the Canon Speedlight. Custom WB with Colorright filters made in the environment and with the flash. I’ve just begun experimenting with gels to warm the light in low ambient light conditions, i.e. where the flash is the main source. I’ve placed the gel between the wide angle diffuser and the flash head. besides for not being able to set the lens focal length (it just flashes 14mm wide angle) am I doing anything to mess up the ETTL communication? Fred, it sounds like you’re on the right track there. From this point on it is a matter of practice and experimenting. Best of luck! I just bought your book and looking forward to read it! I wonder what’s your opinion about this. Also I would like to thank you again for sharing all your knowledge!! Are you planning any workshops in the Netherlands? Alwin, keeping with the concept that the larger the light source, the softer the light, then the Lumiquest would offer better light quality to an extent. By how much is something I still have to test though. Very nice! I like how you modified your sto fen and also the tape is genius. Hi Neil, I just received your book and it looks great! I will ask you a question I asked before but never got a clear answer: what are you doing when you’re in a situation like a big dark church where there is absoluty nothing to bounce your flash of. You just have to use direct flashlight, straight forward to your subject. Do you use the omnibounce without the whole in this situation? And do you use it then straight forward or in 45 degrees? I realy like to know…. Thank you! Alvin .. in a case like that I do use a Stofen, but an unmodified one. I have the speedlight in a half-bounce position since I want to force an uneven light fall-off so that the ground directly in front of me which is closer to me than the subject, doesn’t get so much more light than my subject. Thank you Neil, now I understand how you work in this situations. I am going to try it out for myself. Firstly can I just thank you for such an informative site. My own photography has improved so much with your guidance. As for flash modifiers, I have just come across the Gary Fong Website. I was wondering what your thoughts were on the lightsphere? Ian .. thank you for the kind comments. As for your question, here is my general advice on the usual plastic light modifiers. And my specific advice would be to throw away the tupperware. 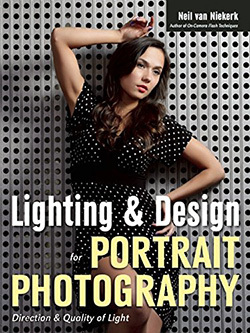 Neil, thanks for sharing your lighting knowledge – I am sure I speak for all of your readers when I say it is photographers like you that add a high level of professionalism and enthusiasm to the subject…. I do have one question… I was curious as to your preferred flash settings i.e. Manual vs iTTL… and how any modifier interacts with the iTTl system.. thanks! Frank … my general guideline is, if my subject moves in relation to my light-source, then I use TTL. TTL works wonderfully here (within certain constraints), in giving me correct exposure even as my subject-to-light distance change. This is most often when my flash is on my camera, and I bounce flash. In general, if my subject is static in relation to my light source, then manual flash makes the most sense. It gives me consistency that TTL doesn’t. As for how the modifiers work with any TTL system .. in theory, the TTL flash metering system, using the preflash sequence, will automatically correct for any light loss. Within reason of course. Neil, I’ve been bouncing flashes for 25 years and I don’t think I ever thought of blocking the light going forward on my onboard flash. I think I’ve done every scrim imaginable with studio lights but this simple idea never crossed my mind. Thank you. Once again, less is more. I shot an event a couple weeks ago in a very dark room and my technique was to use the onboard flash direct with the Nikon diffuser and then add a backlight with two SB-800s on opposite sides of the room. The idea was for the 800s to give me backlight in either direction I was shooting. I made more than a couple mistakes with the remote lights and in the end the job went fine, but after reading these questions, and one response about Quantums lighting the room, I was wondering if you could share a little on how you place and use these ‘room’ lights in conjunction with the onboard flash? IE, direct or bounced? snooted? TTL or manual? Would you occasionally use them as the key light? Thanks again, great information and absolutely fantastic photography. I’m in Westchester, if you ever need an extra hand, give me a holler. Very nice tutorial on flash. I am also using something similar from your half black dome from Chuck Garner ) basically it cost me a dollar more for the white sheet. I can use it without the ceiling too. This may be the answer for someone commented above about not having enough power however he should test these bounce at ISO 100 however a minimum of ISO800 for wedding reception up to ISO1600 is required most of the time. I’m with you for the directional bounce flash and feel confident with it, and using simple modifiers, as well as off-camera with a softbox. However, I’m really struggling with moving quickly to vertical and back during fast sequences (like the end of a wedding ceremony when events are moving very quickly). You don’t use a flash bracket as one of your accessories, I see, yet I feel I really need one so I can leave the flash as it is once I find a good bounce surface and angle, and just flip the camera. I often try a composition, move the flash head, and decide it’s not working and have to go back, then move again and do it all over. I often get so caught up in the photos that I forget to reposition the flash head, and get side shadows on vertical, or have the flash pointing the wrong way for a few shots before I remember to move it back for horizontal. How do you overcome the constant repositioning w/o a bracket? If you do use a bracket, what features do you recommend? Emma, I would agree that using a flash bracket eliminates that kind of fumbling as you switch from horizontal to vertical, and back. – just simple experience in twisting the flashhead around, as well as the piece of foam. – and if I need a vertical, cropping later if needed. With the high megapixel count of most modern D-SLRs (specifically 12 mpx and up), you can get a more-than-decent sized crop out of a horizontal image when you crop it vertically. And this is usually more than sufficient for things such as wedding receptions. 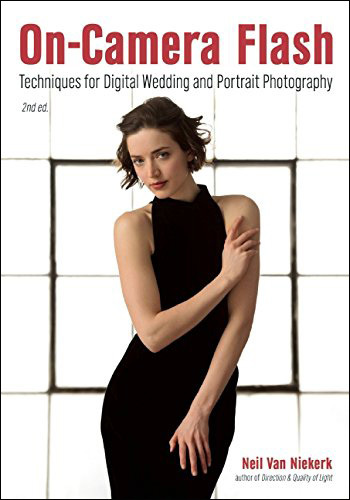 – using two bodies, with the one (for example, the body with the telephoto zoom), set for vertical shots (close-up candid portraits), and the other camera set up for horizontal images. But mostly just experience in rapidly wringing my flash-head around. Alejandro .. that is commonly done if you want to trigger manual flashguns somewhere else. The additional flashguns can help illuminate the scene, or can provide rim-light. Or any way you really want to add more flash. The additional light can either light parts of the background only; or can help light the entire scene. You just need to make sure it doesn’t over-expose the scene .. and then you add on-camera (bounce) flash in TTL mode. You might need to pull down the FEC a bit, since your camera can’t read the manual flash exposure. In reality it isn’t too complex a juggling act. Here’s an example of where I used TTL flash on-camera, and additional manual flash off-camera. After no-one picked your book from my Amazon wish-list for me for Christmas, I had to splash out on it myself last week, and I’m so glad that I did. I feel as if suddenly I actually “get it”, when it comes to ambient light and what a flash can and should be used for, when off-camera flash isn’t an option. Thank you SO much! I had one quick question, if you have the time to answer it. I know you use the D3 a lot now, and previously a 1D Mk3, but I’m using a 40D and I worry about the noise I get at higher ISOs compared to those cameras. It’s noticeable even at 400, and by the time I get up to 1600, it can make the images pretty soft and noisy. I do have a fully paid-up copy of Noise Ninja for my Photoshop CS3, but it’s still a big extra workflow step. My question is … do you still think that the results you can achieve with the higher ISOs (aperture/shutter-speed) make it worth the extra noise that can creep into the images, and how much is that noise a problem in the real world, when it comes to supplying cropped, processed images and/or prints for clients? Thanks again for this wonderful site and your insanely well-written book! Check out this article I wrote on the topic – dealing with high-ISO noise. Admittedly there I used the Nikon D3, which has incredibly good high-ISO noise response. You have to consider your end use of the image, and how it will be viewed. For me, that is more important than looking at ‘absolutes’ in how the high-ISO noise appears in comparison to other cameras, or looks on the screen. With that in mind, you have to find our own maximum high ISO that you are comfortable with. Despite your lighting style and approach, why specifically you wouldn’t use Gary Fong diffuser/modifier? Taking to the consideration that fact that even with your foam flag you do get undirectional light but do loose most of your power. On top of that, from my experience I can see often not enough reflecting surfaces (except ceilings). WB might cause another issue from brightly colored walls. Maks .. it is specifically the lighting style and approach that I choose. What more should there be as to why I don’t like the results from the on-camera plastic light modifiers when I work indoors with bounceable surfaces? It’s all about style and approach. I can’t achieve this look, or this result with the Lightsphere and Whale Tail / Toilet Bowl and other clear plastic light modifiers … so there is no reason for me to use them then. I get better results NOT using them. I’m not sure what you mean by ‘undirectional’ light when I use something to flag my flash? I actually do get directional light. That’s the entire point of doing so. As I’ve mentioned numerous times on these pages .. when there aren’t surfaces to bounce flash off, then you have to use other techniques. Using the piece of black foam (or anything else), is NOT a cure-all. I don’t present it as such. You have to improvise and adapt, and continually guide your technique and approach by the results you achieve, and want to achieve. Neil, do you ever use a flash bracket with your black foamie thing, or do you find you don’t need it. Also, what are the most common situations where you find you had rather not use it, if any. I appreciate your knowledge and willingness to share. Thank you much. Larry. Larry, I don’t use a flash bracket any more. It has its uses, but I don’t find it necessary. Hi Neil just ran on to your black foamie thing and I am going out tomarrow to get some to try I have been taking Photos for a year now and it is usually nature things but I have a cousin that want’s me to take pics of her 9 month old and this may just be what I need. I have the xsi and the 430 ex and a off camera cord and bracket any suggestions would be greatful you can email me if you would prefer because I could use the tips on portraits…I am on flickr if you have a time take a look and my stream and please give me some tips for I have a great passion to learn I love photography….my flickr name is pens2009…Thanks again and I’ll let you know how I do with your art work!!!! Hi there Carol .. I’m glad you’re enjoying the info on this site and find it useful. But .. um .. I have to email you some tips for the photo session? If you have a passion to learn, then delve into the rest of the material here. You have some homework to catch up on. I’m a recent follower. I’m bummed I did not discover your site sooner. I spent a hell of a lot of money on Gary Fong because the pro’s I interact with convinced me they were the best diffusers for wedding photography. I have rubberbands, I shop at Michael’s and have extra diffusers I could cut out. I don’t have gaffer’s tape which is on my shopping list. I appreciate your humble ways of making things work. Also, You have over 4000 images on your Flickr page. That’s a lot to go through and it is unreasonable to expect a professional to comb through all of that. If you want a critique of your work, the best thing for you to do is select 10 to 20 of your favorite photos that you feel best represent your work and put them in a separate gallery for review. When I review people’s portfolios I expect them to take the time to organize and properly present their work. I don’t want to see a set of quickly printed 4x6s in an envelope. Why should I spend my valuable time on something someone doesn’t care enough about to present properly? I always feel a review of my portfolio is a gift, and it needs to be treated with a great deal of care, respect and appreciation. I hope this is helpful. I hope your shoot is successful and that you continue to learn and educate yourself about photography. Should you use CTO gels for fill flash outdoors? Would that have the same effect as using a gold reflector? Thanks so much Neil! I’m sorry that I asked a redundant question. I’ve read all of your articles, multiple times, but I didn’t realize how much information there is in the “comments” portion of each post! Thanks again, it’s really, really great that you take the time to answer so many questions! the light source, so how can it soften the light/decrease shadows? I noticed that even when there is nothing to bounce the light from it still seems to soften the light. It’s just spreading the light good enough to make the light softer? Alwin .. when there is nothing to bounce the flash off, the omnibounce will scatter the light more than direct flash would .. and this will slightly reduce the contrast, and soften the light slightly. Neil, in a situation like that (nothing to bounce flash off) it seems to me that it’s better than to use something like the betterboucecard (the big one) instead of the omnibounce. The bouncecard will provide softer light than the omnibounce does when there is nothing to bounce. Am I right about this? The larger your light-source, the softer the light. Even if only marginally. Chris .. the gel in that photo at the top is the 1/2 CTS. I use either a full CTS or a 1/2 CTS gel. For outdoor work, check comment # 102. Re simplicity … I decide to keep it simple. Just those two gels. We’re fortunate in that we have a lot of leeway compared to commercial photographers who need to work with exact color values. So those two gels get me where I want to be most of the time. re the ceiling height. There’s no specific height that I could say, since it also depends on our choice of aperture and ISO. Neil, Made my own black foam diffuser last night and tryed it out. I really like the look of my shots much better bouncing the flash accross different surfaces. Looks much more natural then system I was using. I do already have a full sheet of the rosco 3441 full gel and have a sheet of 3442 1/2 gel on the way. So if im understanding this correctly you use the full CTS for inside work and the 1/2 CTS for out door work and do set custom white balences for each situation. I have been expermenting using kelvin settings but cant seem to hit it just right. would also like to set white balance with flash also. So much great info here on your site. Would also like to know the name of your book. Thank you for sharing all this great info. Chris Mann. Chris, no, I don’t distinguish the use of the full CTS and 1/2 CTS filters like that. 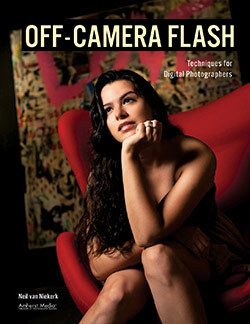 Here are the details of my book on flash photography. Neil, Now that I know what book im looking for going to purchace it. Cant wait to see what information I will learn from it will do for my flash work. thanks Chris Mann. HI Neil I noticed on your second shooters camera she had on camera flash and a pocket wizard. Was she using the pocket wizard to trip remote lighting at the same time she was using on camera flash. Was the pocket wizard hooked up to the pc port on the camera. Interesting set up. Andy .. yup, the PocketWizard was connected to the PC port. 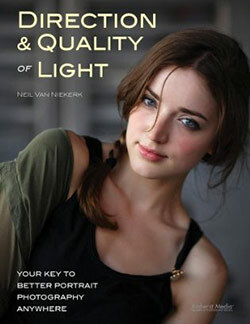 Hi Neil, Bought your book yesterday and cant put it down I love the simple approach to lighting. Also like how to expose for different tonal values in images by just using camers exposure and folling up with flash.Also forming me through your book about reading historgrams to help reduce digital noise. I also think I understand your use of the CTS gels now. Just using one to make light alittle warmer compaired to the other. Wish I would have found your book along time ago. Have been banging my head aginst the wall all this time for nothing. Was wondering though when you underexpose for a darker subject where do you start 1/3 2/3? Just curious. Noticed you have the Demb flip it and peter greggs bounce card pictured in your book I own both and do you ever use them. I have the same bounce card picturd in book with black center black strip and like it alot. Re exposure metering with darker subjects. The first thing we need to consider though, is that we are NOT “under-exposing” when we photograph a subject or scene with predominantly darker tones. We are exposing CORRECTLY by pulling our exposure down. By how much we should pull it down isn’t something I can give specific advice over. It really depends on how dark the tones are and how you want to portray the scene. Re the Demb Flip It and Better Bounce Card … I have them, and photographed them for illustration there. I keep them in my camera case, but rarely rarely use them. In fact, I haven’t used the Demb Flip-It in about 5 or 6 years. There’s just no need to for me. Neil, Im about 3/4 the way through your book now and was curious about one more thing. You talked about trying to bounce your flash outside also with the help of an assistant if needed off a refelctor or other surface if possible but what if you dont have access to any of this at the time? Will you shoot straight on flash with gel in place or use white bounce card? Have been using your bounce flash inside now and all different directions and what a world of difference this makes. Shooting a 50th wedding ansv. party this weekend and cant wait to try this tech. there. That little piece of black foam is majic. Also when I read about setting flash what does that equate to +0.7? Thanks again neil, and do you ever travel around to other states and give seminars about your ideas on lighting? 3. what if there is nothing to bounce flash off? Your right, and thank you did not see these sections. The umbrella bracket idea is very creative but I dont think I would be lugging that around looks heavy and kind of silly. Liked the wedding shots with flash bounced off of store fronts. Havent tryed bouncing off of glass yet. Thought light would be lost. Seems like almost anything wiil work though. I am creating a larger bounce card for outdoor flash with black strip in center. Taking peters idea of bounce card with black strip in center and just made larger verision of it 8×7 inches should give enough fill I hope. I will let you know. Not shooting with straight white cards any more if I dont have to. Chris Mann. Neil, just finished finished your book yesterday and I’m impressed. Have incorprated a few things into my shooting style now. I have but a few more questions though. when you have a white or lighter color wall and a darker subject what is your preference for tonal value in scene are you pulling exposure down and using flash for or taking exposure up for white wall? Also have been trying flash exposure comp to overtake the ambent light from windows. Are you doing this with black foam diffuser in place. I am not having much luck. Do you have a book out yet for off camera flash? Thank you for your help. Chris Mann. Chris … when I bounce flash I am nearly always in TTL mode on my flash. Then, in theory at least, the camera and flash will calculate the correct flash exposure, and automatically give less or more power, to overcome the tonal value of the surface you are bouncing off. Chris, when you bounce flash, you have to be realistic. There are only so many electrons that can be turned into photons. Therefore sometimes it just isn’t possible to get enough light from a bounced flash. That said, I am assuming you are working at maximum flash sync speed in this instance? Also make sure you are using that black foamie thing correctly – as in, just enough of the foam to flag your flash. It isn’t a diffuser! It’s a flag with which you control the direction of your bounce flash. The book on off-camera flash is slated for an April 2011 release. Neil, Have worked with to many diffusers. My mistake. I have also been working on other styles when there is nothing to bounce flash off of, but I will have to tell you that I have been getting good with the flaged flash style and loving it. Has changed my flash work for the better. Fun to create a different approach of light into scene and different effects than can be done,and I am using max sync speed when the light allows it. Have learned much from your book. Thanks, Chris Mann. good tutorial/explanation on how to use flash lights. I don’t want to get too much going on for my first wedding. The couple, although on a budget and we’ve worked a deal in order for me to build my portfolio are comfortable with what they are receiving at the price and I have a good contract in place as well. Neil, I have been primarily a landscape and wildlife photographer, but after finding your blog I’ve been totally immersed in learning your flash photography techniques for portrait work and perhaps weddings. I made a couple of your Black Foamie Things, but when I use them on my two Canon 580 EX II Speedlites the flash units make a very distinct POP sound when they fire. It happens every time when the 1/2 snoots are in place, but they fire normally (quiet) without them. Have you experienced this loud popping sound from your 580EX IIs with the flags attached? I’m concerned about the extra noise for quiet settings like a wedding, but also concerned about possible damage to my speedlites. Any guidance? Thanks for considering this question. I’ve learned so much from your site that I can’t even begin to thank you enough. I bought your book, and am eagerly awaiting your Off-Camera flash book next spring. John, I suspect you are using the piece of foam as too large a flag. You need to manipulate it so that only enough of the foam extends to block / flag the flash as is needed. Check the updated post on how I use the black foamie thing. Thanks again, Neil. I had missed the updated post — sorry for asking an unnecessary question. When I adjusted the amount of foam extending from the flash head, it works fine. No problem, I get lost around all these side-roads as well some days. Hello Neil, I just found this site and has already tought me so much. I am a housewife which photography has been a hobby I enjoy, but have never had any training or professional equipment. I recently purchased a Nikon D40 and I am being encouraged by friends and family to shoot for pro. So I made a free site to show old pictures I took with a small camera I had before the Nikon. I have so much to learn. I find it sooo interesting all that you teach on lighting, and I loved the black foamy thing, =-). I have not purchased a speedlight flash, I will have to do a bit of saving for that one, lol. I would like to ask how it is that you make the background on the picture above, all blurry but still keep the bride and groom so clear? Thank you for this site. Your are very helpful and inspiring. Hi there Sarah … I assume you’re referring to this photo? The separation from the background is because of the long focal length I used here. I used a 70-200mm zoom lens. And by using a fast aperture (around f2.8 or maybe f3.5), the depth of field appears really narrow. And there is the separation you’re seeing from the background, with the background all blurry. Here is more details on how to get a blurred background in your photos. Or the Sigma 75-300 4.5-5.6 for Nikon? Sarah .. those lenses will probably not give you what you’re looking for. Neil … its amazing that after being at one of your seminars and reading you book at least two times, I seemed to have missed the orientation of the BFT. From the pictures on your web site and in your book, I had it reversed. I had the Black Foam on the top side of the camera. In other words, on a 580EXIi, I put the BFT on the side that has 580EXII stamped on it. Your photo’s show it just the opposite. Nevertheless, I seem to get a similar effect – sometimes striking. In your opinion, does it “really” matter. Yes, the placement of the Black Foamie Thing does matter. Simply placing the BFT over the flash, ie, on top of the flash-head, doesn’t do anything to direct the light. It would also direct the light too much towards the wall and floor, rather than upwards where there might be a ceiling or other bouncable surfaces. And with a vertical photo, the BFT needs to be (depending on how you need to bounce your flash), it will either be on the underside of the flash-head, or swiveled slightly. – you don’t blast flash into the eyes of people standing next to you or behind you. OK, things I learned. The BFT pretty much requires an external battery pack. (I have an Al Jacobs Black box with a strap). And not the BFT can’t be a WFT. 1) Are you able to use TTL with the BFT or are you using manual? 2) What do I ask for when I walk into Michaels/MJ Designs/AC Moore besides a sheet of Black foam like Niel Van Niekerk uses? (and blank stares abound!) I read where stiffened felt doesn’t really do the job. Can I get some dummy type specifics here? I mostly shoot in TTL mode when I am on the move. The BFT doesn’t affect this. In fact, TTL mode makes it easier. The foam is called “fun foam” at Michaels. Fantastic blog with some great ideas. Thanks for sharing. Dear Neil, I am a photograph beginner in Taiwan.Thanks for your kindly sharing so much information about flashlight. And there is a question:Could the black foaming thing be used for a wedding photograph and some kind scenes like that? Or it can only be used for indoor photograph? Hi there Eddie .. the black foamie thing isn’t a flash diffuser. It just modifies the light from your on-camera flash when you bounce it. So it kinda has to be used indoors where there are surfaces you can bounce the flash off. On occasion you can even use it outdoors if you can bounce the flash. But it certainly isn’t a do-all flash diffuser. Not sure how I stumbled onto your website but I wish I had known about your site long before now. What would be your equivalent of trying to get the same results with a Quantum Trio or Q-Flash on-camera as you get with the Black Foamie Thing on your Canon or Nikon Speedlites. Would the Bare Bulb Enhancer or the standard reflector give a similar effect if the enhancer was positioned in front of the flash tube, especially for wedding processionals. I did try that same idea originally with the Quantum Bare Bulb Enhancer (B&H), tilting the flash backwards. It worked quite well, except that the reflective part of the half-snoot, threw too much light forward. If I had to do it now, I would blacken the inside of the lip of the Bare-Bulb Enhancer. It could work! Back on the question of the Bare Bulb Enhancer, would it make sense to put the enhancer on the front side of the flash tube (facing the subject)so that all the flash is directed upward and behind? Possibly pointing the tube straight upward and blocking any light flashing forward. Shouldn’t that work? You could merely swivel the flash head to suit Bill, I have the Trio [for Canon] but since switching to Nikon I use it on a stand as off camera flash, but I have used the bare bulb enhancer [silver] and merely swiveled head around a bit. In hind sight I would spray inside black so it acts just like the black foamy thing but that’s a moot point now that I use my speedlites and have Quantums as OCF. Swivel in conjunction with you mounting it backwards or any way you like, though it may have to be just inside the head and tighten up without the little slots being pushed right down, if you choose anything other than correct or totally backwards as the slots line up to fit into the head. Speaking of tightening anything with the Trio, be aware of how much you tighten, I am afraid it’s not very robust, in fact I would go so far as to say it’s pretty darn ordinary. I’ve treated mine carefully, but where you tighten in the diffuser, it’s cracked and eventually a damn piece of it broke out, so I now have a black garden zip tie right around the edge of the head to keep it all together. Also the foot where you tighten it down, it’s come loose and just won’t tighten any more and although I have it mounted on a stand, with a cold shoe to clamp around the edges of the foot, the foot part that goes into the base of the Trio is loose and floppy, very poorly made. I’ve never been rough, dropped it or carried by the head. I would never buy another that’s for sure. Its a shame for the Trio’s build quality. Up until now I’ve been using a converted X3D-R on a camera bracket. That 200 WS really bounces some light around. Just wish those great electronics could be put into a more refined housing. Was trying to decide between a new Qflash T5d-r or the new Canon 600EX-RT for on-camera. 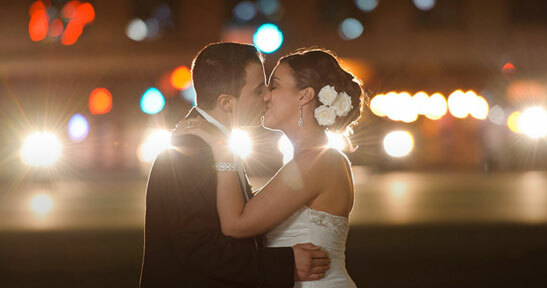 Would you be concerned about the new Canon 600EX-RT overheating on a typical wedding shoot? We keep hearing about not shooting any more than 20 consecutive shots due to overheating and the unit shutting down. Guess it scares me a little. Was thinking about running the Canon off of the Quantum Turbo 3 which I have for my Trio. Can’t make up my mind. I know this sounds like a broken record but I’ve learned more from your site in the past few weeks than all the years I hung around Monte and Ziser seminars. Been shooting weddings over 25 years and am still hooked, especially since the new technology is making life a whole lot easier. Can’t wait to try this. Looking forward to reading your book. Thanks for the tips! It was a life saver, I had an assignment where I needed to shoot flash under Tungsten light. Your gel tip is very useful. Which is the best flashgun?